The GTS appellation has become Porsche code for “options at a discount,” and indeed the Cayman GTS is no exception. 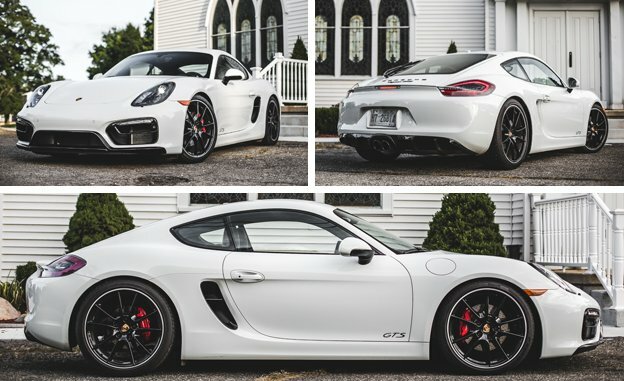 You get more than a dozen Cayman S options—including Porsche Active Suspension Management (PASM), the Sport Chrono package, sport exhaust, and some interior dressings—for thousands less than what those items would cost on the regular-old S, plus 20-inch wheels and Pirelli P Zero summer tires that might be good for 15,000 miles. Oh, and 15 extra horsepower for an even 340, via the magic horsepower screw seemingly fitted to all Porsche engines. The GTS doesn’t feel any faster, and indeed, it isn’t by much. With a six-speed manual that suffers an overly stiff clutch pedal, it pierces the 60-mph mark in 4.1 seconds and the quarter-mile in 12.5 seconds at 113 mph. That’s a tiny smidge quicker than the regular S; we’re happy to call it even, just so you understand that 15 horsepower doesn’t buy the moon. Nor did the large Pirellis prove any great deal stickier than the Goodyear Eagle F1s on the S. Not that generating 1.04 g of grip on the skidpad is a problem, but it’s only a teeny bit more than the 1.03 we got with the Goodyears. Hey, call that one even, too, what with variations in surface temperatures or test drivers. We do prefer the feel provided by the Pirellis, especially on the track. So, what have we got? Well, a car that—with optional baubles such as the $3680 GTS interior package, $3990 Bose entertainment system, and $1425 black-painted wheels—goes from a $76,195 base price to $95,265 with add-ons, just into911 Carrera territory. As Porsche’s mid-engine sprite, however, the Cayman offers tangible benefits over the 911, including a more garageable size and less bounding over pitching pavement. It’s been a while since the Cayman took over as the prime Porsche for enthusiast drivers, the basic 911 evolving into a rather gigantic GT that is longer than the current Chevrolet Corvette. The GTS only reinforces the position with a samurai’s lightness on its feet, seeming to accelerate and turn as if it were 1000 pounds lighter than it is. It’s much closer to what we think an old 1970s 911 with paper-thin doors and pencil-thick pillars should feel like, although the GTS is far less squirmy on its modern, mongo rubber. It could almost be accused of being too capable, the cornering speeds reaching silly heights before the chassis even feels challenged. Sure, buy a McLaren to be a rock star, but get a Cayman if you just need to be someplace quickly and with a smile on your face. Direct, focused, and not flashy, this is the car James Bond would drive home after he parked that circus-prop Aston Martin at work at the end of the day.